I made time to watch Panic in the Streets over a year ago, and for one reason or another never finished it, but thankfully the fine folks at Fox have changed all that with their recent Blu-Ray release of the movie! The film isn’t Kazan‘s best work, but is a highly functional film noir with a real-world threat at the center of it. With a thoughtful performance by Richard Widmark and a truly unsettling one by Jack Palance, it’s a well-done film noir, and even better on Blu! When a deadly plague makes its way to New Orléans, a doctor from the U.S. Public Health Service (Widmark) must go on the hunt to track down the carrier and prevent the spread of infection. 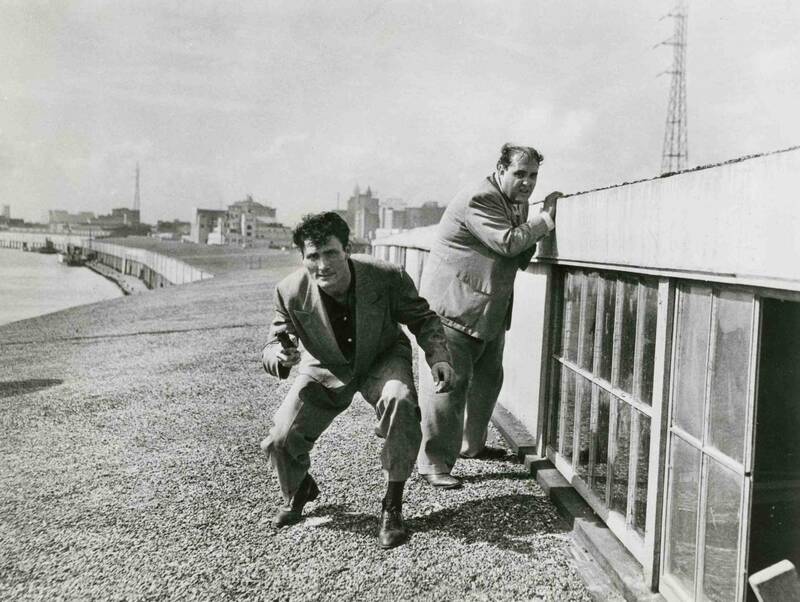 Kazan elevates Panic in the Streets above mere noir (which is always good but has tells of its own) by the fluidity between noir conventions and real-world problems. You aren’t dealing with a couple of gangsters getting shot, money going missing, or a girl being caught in the middle; this plague could kill millions, and once it’s unleashed it cannot be contained. The stakes have never been higher because they affect everyone globally. With that being said, the plague starts to take on human qualities once Clint Reed (Widmark) starts to investigate where the disease came from. Once that happens, the story takes on tones of the conventional noir with Clint interrogating people with all the ferocity of a criminal browbeating a man who owes him money. 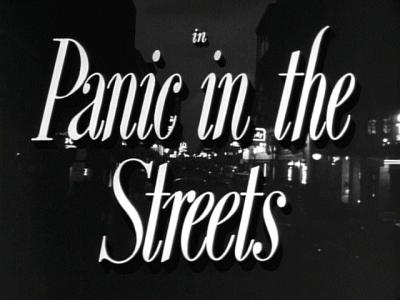 Standard themes of the film noir genre are also employed, including shadowy streets, seductive jazz, gambling, and high contrast lighting between black and white. What’s unique is that most of these elements are contained to the criminal underworld of gangster head Blackie (Palance). I was blown away by Palance’s performance because he’s got a menace to him that requires little effort to make you scared. The majority of the time he’s terrorizing Zero Mostel‘s character, Raymond Fitch. Palance says his words little above a whisper, plays on people’s emotions or lack of knowledge of him, and generally acts like a snake ready to strike. His self-righteousness is what creates a character you yearn to see more of him; he’s utterly devout in the belief that “I’m always right because I never trust anyone.” You’re not supposed to find any good in the character, but he does have moments of benevolence, like with the errand boy who shows up now and then. The only issue I had with Panic in the Streets is that Blackie appears to be working in an entirely different movie. He’s such a cookie-cutter villain from a typical noir that the balance is never right. 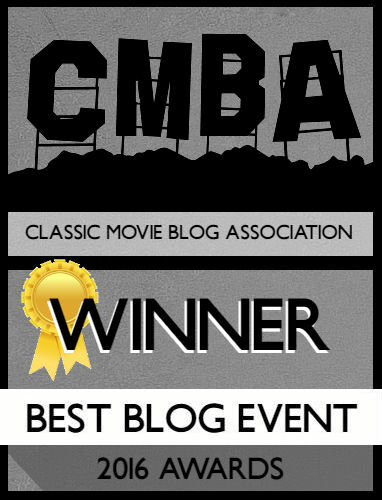 Blackie is a character from a gangster noir, while Clint is running a medical mystery story and neither the two really meet. It’s over an hour before Blackie and Clint actually are on-screen together and it happens entirely by accident. It’s important to the movie because Kazan wants to communicate a new breed of noir, but I had to change my tone and the way I watched the movie based on which character was focused on. Widmark is the character whose story is enhanced and featured. 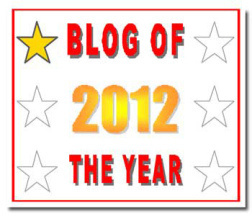 We see how prosaic Clint’s life is, and how the plague works as a microcosm for his home life. Before all this there’s a lackadaisical quality to death, the belief that nothing truly harmful can touch us because of government institutions and modern medicine. A morgue technician completing an autopsy – who ends up discovering the plague itself – is talking to a friend about food and girls while he’s cutting someone open. 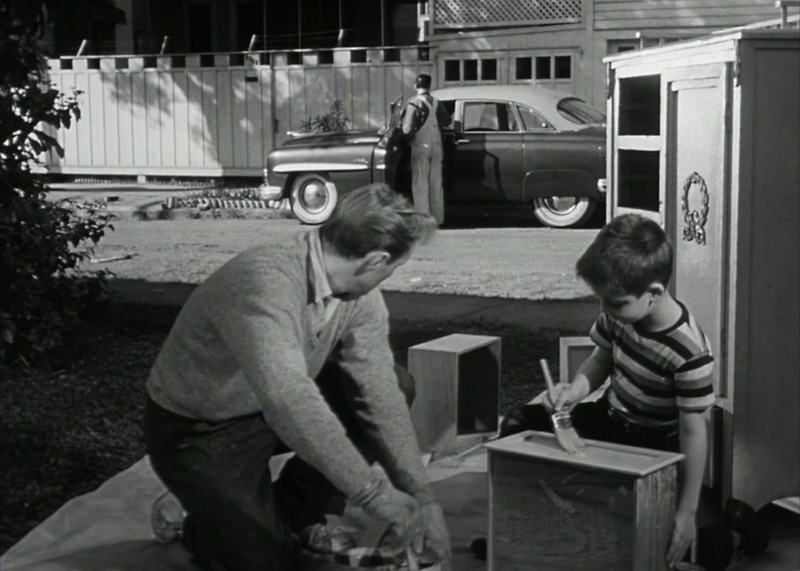 The idyllic home of the Reed family is also the picture of normality with Clint having a compassionate relationship with his young son and loving wife (played by Barbara Bel Geddes) despite the fact she’s usually telling him about how broke they are; despite being a doctor, there’s no money in working for the state, or for being on the “right” side of the law. The ethical question of why we don’t pay people like Clint more, people with their finger on the pulse of what’s needed to keep America safe, is never delved into; we simply see the fact that much like the bills that are coming due in the Reed household, the plague threatens to be a bill that people can’t get rid of. Science and government have always been at loggerheads in Hollywood during this time period, but here we see the man of science being the one with knowledge to save humanity and he’s ignored. I don’t fully understand the complete lack of interest from the government, though? Why they would send a man alone to investigate plague without so much as a partner is beyond me. Furthermore, Clint spends a lot of time inoculating random people but never himself? I guess plague is no match for Richard Widmark! Widmark surprised me here because I’ve never seen him play heroes. I don’t fully believe him in the all-American boy role, there’s still something depraved lurking underneath that blonde exterior, but he did well. The Blu-Ray looks and sounds great, but I’m not that proficient in the technical side to comment beyond that. The strongest feature is the audio commentary with historians Alain Silver and James Ursini. If you’re interested in historical events, analysis of the movie, and comments on the cast and crew, then pop this in alongside the movie. Each commenter is knowledgeable in everything related to this film, and there’s hardly any dead air. Other than that, there’s two profiles on both Palance and Widmark; both of them run about 45 minutes each. The Palance feature is a made-for-television special featuring interviews with various celebrities. It’s a few years old, at least, with appearances from Billy Crystal and others. The Widmark profile is significantly dryer, I’m not sure if that means Widmark was a boring guy. Each one will have varying amounts of interest to the audience depending on the actors appeal to you. It’s a small amount of features overall, but the commentary adds to things immensely. 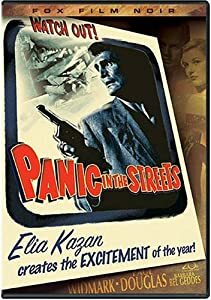 Panic in the Streets is a concentrated mix of noir and mystery, both criminal and medical. The script has trouble compromising on which characters and angles to devote the time toward, but it creates a contained movie worth watching. The Blu-Ray is light on features, but the audio commentary and best audio/visual components make it worth watching or buying if you don’t have it. I haven’t seen the Blu-Ray yet, but I want to at some point. This film is still relevant today. How long will it be before a super-bug comes to America? I love Zero Mostel’s performance. He is so obsequious to Blackie, and yet he is a bully to his wife. I laughed when he said “We’re his best friends.” A minute before that, he dropped Poldi on the bed like a sack of potatoes. I like your analysis of the acting. Great observations. I never thought of this film as a true noir, but you point out many noir conventions in the film.